Some best golf club for beginners sets are custom-designed to go easy on the budding golfer. They build your potential until you can move up to tailor-made clubs for yourself. While your capabilities as a golfer decide your handicap, the right golf clubs for beginners could give you a head start on your game. High handicaps need to be brought down a few rungs by a consistent and smart golf performance. This requires golf balls to make contact with the sweet spot on your clubface more often. We picked the 5 best golf clubs for beginners 2018 that help you build a strong foundation for your golfing skills. Callaway Men’s Strata golf set has the nurturing touch that every novice golfer needs to attain the pro swag. Their golf clubs compensate for the assumptions and lack of strength that new players display. The handy golf bag and stand only improve their usability index. The whole package makes a solid case to be on the best golf clubs for beginners list. 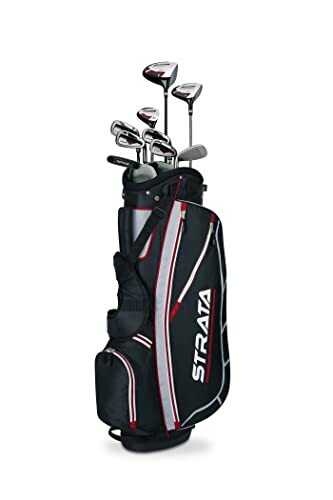 The Callaway Strata golf club set can work for both left and right handed golfers between the heights of 5’5” and 6’1”. The clubs are regular flex. The grips have an alignment assembly that makes you hold the club properly. The driver comes with a higher loft of 12⁰. It lets you control your swing with a bigger sweetspot. The 3-wood kicks up the golf balls high with its aerodynamic shape. Its 42-inch graphite construction yields good distance when you are at the second stroke of par-5. The 5-Hybrid has closed face and a steel shaft. The alignment grip on this helps you make truer shots. It is the easiest club of the lot. Steel irons have a nice loft to them so that they turn out forgiving while lending you power over them. The putter with T-style alignment is light and not as durable as the other clubs. The headcovers included with these starter golf clubs do not come off when moved around. The bag has a lightly padded harness to carry it. It is useful but not highly durable. 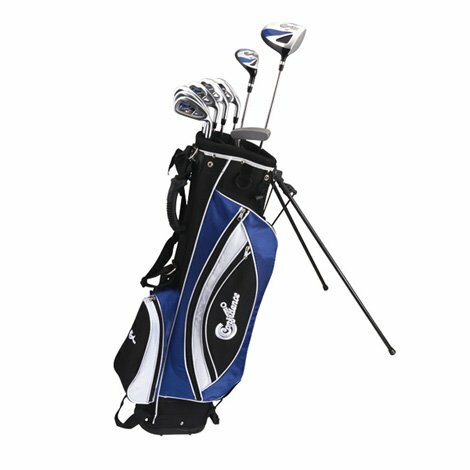 Confidence Golf men’s Power Hybrid club set is one of the most budget-oriented starter sets for new golfers. At its price, it makes a few compromises on the quality. But if you are a quick learner, these golf clubs will see you through the basic training of the beginner’s phase. Hence their place in the best golf clubs for beginners list. The Confidence men’s Power golf clubs are mainly meant to put you through the paces of learning golf. This is a right-handed set only. The ladies version of this golf club set is also available. The driver has the decent 12⁰ loft to drive the golf ball far enough. The hybrid comes with a steel shaft and takes a fun turn where you should be struggling with long irons. The irons have cavities carved at the back to arm them with patience to deal with a noob’s shot. The putter also features a steel shaft for better stability. These golf clubs can work for tall people up to 6’3”. The choice of clubs is well-thought out from a beginner’s point of view. If you have already gotten some practice and are looking to graduate, then choose a better set like the Callaway Strata or a used TaylorMade set. The accompanying stand bag is pretty good for the price. Its two-side shoulder straps make it easy to carry. It even has a rainfly to keep your golf gear dry. Adams Golf is a seriously underrated maker of golf clubs. The Speedline Plus set is a trendsetter in terms of creating game-changing golf sets. It is a complete package that helps the golfer in every possible way by trying to control the natural elements for you. Nothing more can be asked of the best golf clubs for beginners list. 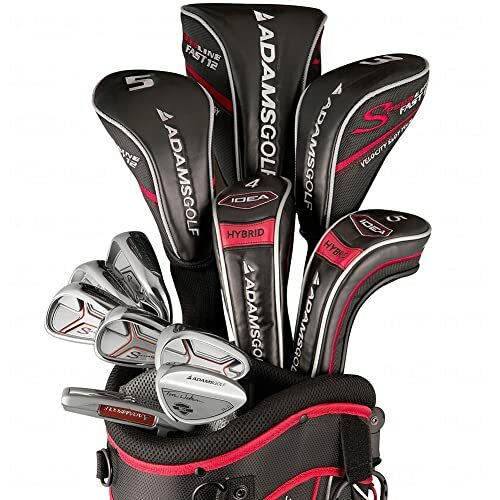 All hybrids and woods of Adams Golf Speedline Plus golf club set have graphite shafts. The irons use a steel shaft. Both stiff and regular flex types of this set are available in the market. The driver is streamlined to reduce the air drag that restricts the swing. Its shots are straight and true to your estimation. Fairway woods are made to deliver high distance shots with their enlarged sweet spot. Hybrids see some serious technicalities that help in a swift and precise shot. Irons are the most lenient of the lot and end up helping your game in more ways than one. The sand wedge amongst these starter’s golf clubs is based on Tom Watson’s playing style. The putter is made to be ultra-stable with a stainless steel shaft and perimeter weighting. A golf bag is included with the pack. Headcovers for woods and hybrids keep these fragile clubheads safe. The Pinemeadow Golf PRE Progressive Hybrid Set is a highly customizable pack. They have this set for both males and females. The flex also has options between ladies, senior, regular, stiff and extra stiff designs. Apart from the standard length it has five other size options. Wild horses couldn’t have kept it out of the best golf clubs for beginners list. The highly affordable package of Pinemeadow golf PRE Progressive golf clubs redefines versatility. They give you a wide choice of shafts and grips to go with other customizations in their set. These clubs are truly meant to improve your handicap. They are highly forgiving with a sizeable increase in the clubface sweetspot. The hollow structure increases the shot distance by at least 20 yards. The large hitting area keeps your shots straight. Even the mishits detour less than the usual golf clubs. The weight of the club heel lowers the center of gravity substantially. This causes the ball to rise at a larger angle to the ground. These starter golf clubs exhibit progressive sole-widths aimed at sweeping the club rather than coming down hard on the ground. This set retails at a very reasonable price. The departure from traditional irons has benefited seniors and amateurs with their golf game. Wilson Sporting Goods Ultra complete golf set has every piece of hands-on golf equipment required. If you are planning to start off the game armed to the teeth, then this set is the perfect fit. They also aid the novice golfers by giving them a taste of the same success that pro golfers enjoy. This gets them hitched to the temptress that golf is. Now wonder, these wily golf clubs grabbed a spot on our best golf clubs for beginners list. The driver and fairway wood of the Wilson Sporting Goods Ultra Complete golf clubs set have graphite shafts. Steel shaft helps mobilize the irons with some control. The Moment Of Inertia(MOI) of the putter is kept high so that you can make the winning stroke with spot-on accuracy. The driver suffers through mishits very calmly. The 4-Hybrid is easily the most adaptable club. These starter golf clubs work well for men up to 6’1” height. They come with a stand bag. For their cost coordinate, this bag is of great quality. Apart from the club rack, it has front zippered pockets for keeping your cash, phone wallets etc. as well. Buying the right golf club is not a science. It’s an art of maintaining your patience and being aware of your comfort level. So it could be overwhelming to narrow your list down. All you need are these minor tips from us and help from a sales personnel. Together they make sure you don’t get more than you could afford or less than what you wanted. As per USGA rules, you can carry up to 14 clubs to your golf tournament. These would be 1 driver, 2 woods, a hybrid, a putter, 2 wedges and 7 irons. However, as a beginner you need to buy only the driver, putter, hybrid and a basic iron set of 6-,7-,8- and 9-irons. The other clubs are rarely used and only brought out when you achieve the finesse to make shots with them. Most of the standard golf clubs for men are suitable for 5’10” height. If you are much taller or shorter than that, it’s better to opt for club fitting. One of our best starter golf clubs set, Pinemeadow PRE, offers variation of club lengths in its golf club sets. Such customized sets are a good option if club-fitting is out of your budget. Golf shafts make a huge difference to your swing. Depending on the shaft material the shaft flex will differ. Shaft flex is a measure of the bendability of the shaft. The graphite shaft has more flex and swings easy. These are best fit for people who can’t put a lot of raw energy in their swing. The other shaft is steel. This is stiffer and controls the swing of burly, powerful golfers. Higher clubhead size means there’s a larger sweetspot on its face. This allows the amateur golfers to hit the golf ball more consistently. They have a higher Moment of Inertia which reduces the chances of mishits. The best golf clubs for beginners include 460 cc drivers for premium performance. When you are plunking greens into starter golf clubs, consider whether you are going to use them frequently enough. If the plan to store the clubs nicely and leave them to rust, try to go for economic options like Confidence Power Hybrid set. Be sure to pick up a golf bag for your clubs. A good bag will be ergonomically designed to carry the load and will have enough space and protection for your personal effects. The best golf clubs for beginners usually ship as sets with golf bag. If you have a low budget but you yearn for a good quality set from Callaway, Adams or TaylorMade, you may consider a used set. You can use them to improve your game and buy a new set when your skills match up to it. Budget is on top of your mind all the time. The best golf clubs for beginners we picked have a couple of highly inexpensive options for the starters. Based on your need, skills and spending capacity, you can select the reasonable golf clubs. A starter golf club not only shapes your game, it builds your confidence early on. Practice with these helps to iron out the kinks in your swing trajectory and power. Once you are ready to graduate from these, you can move up the golfing ladder with conviction. The best golf clubs for beginners 2018 can soften up the process of learning this complex game.